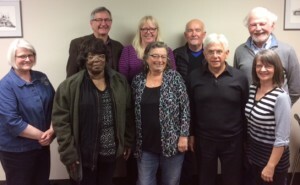 At a meeting in Red Deer on April 26, AFUR elected a new executive and committed to organize events to mark the United Nations International Day of Older Persons on October 1. The full annual general meeting will be held in the spring of 2017 at the time of the Convention of the Alberta Federation of Labour. Susan Keeley was thanked for her contributions and invited to attend executive meetings with voice but no vote. The Presidents of Calgary and Edmonton Area Councils were also invited to participate with voice but no vote in order to facilitate coordination.